"Were they born mentally challenged or did the men's extreme psychological shortcomings take place as a result of this sport?" I wondered as I watched the cowboys prepare for, then suffer, abuse after abuse? I'm not a big rodeo fan. 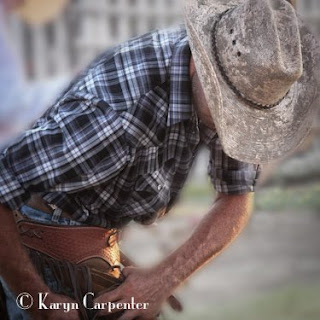 Okay, I'll be honest - I'd never been to a rodeo before in my life - but I've always been drawn to cowboy images. You know the ones - whips, spurs, chaps, cute butts……. 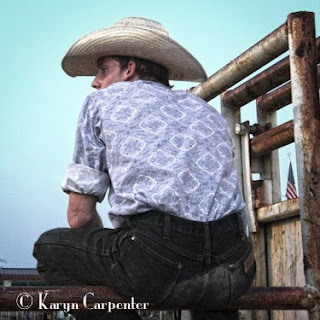 There's something seductive about the life of a cowboy; a man living and working so close to the land. A man in love with his horse, hanging with those cute cuddly looking cows all the time……. So, I figured going to a rodeo was about as close as I was going to get to a cattle-drive on an open Montana range. The local paper arranged a press pass so I could get behind the scenes, and I spent 3 hours watching men preparing for what was to come. They wrapped their arms in tape, they explained, to give their arms support and to keep their muscles from being ripped off their bones when they were on the horse. (Ouch!) They strapped on chaps, donned padded vests, and tied a donut-like device around their necks to try to avoid whiplash. I could see this was going to get really ugly. A few of the men seemed to be spending an inordinate amount of time in prayer, and one sad-looking young cowboy, glancing towards an angry bucking horse in a narrow metal pen, was getting a jump on the pain by digging into a prescription drug bottle. And these guys were just riding ticked off ponies. The men taking rides on bulls (and these bulls had some real unaddressed childhood issues which was now coming out in major rage, I assure you) - were strapping metal cages to their heads! 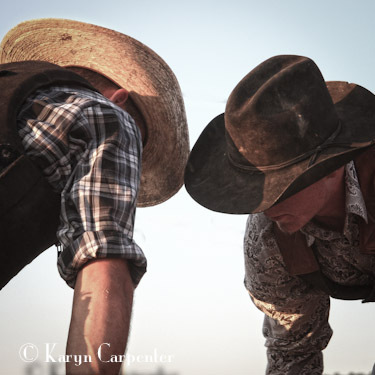 So, this is the romance behind the rodeo cowboys….. behind the men who week after week crawl up on animals that take no delight in having 180 pounds of human on their backs in 110 degree temperatures. I can't say I blame the animals for being enraged and working like hell to toss the pests from their backs. But I'd still love to see the IQ scores of the men before they took up this hobby and then again after they'd been doing it for a year.